I bought a bicycle earlier this summer, after all projects and every problem with parts that do not fit properly. I realized that it would have been cheaper and better for me to buy a complete bicycle from the start. Because this idea I had of using old part that came from my grandfathers old bicycle many years ago. All projects I had was either dificult to assembly or did not “feel” right. But one day I saw an ad on internet of an old bicycle for sale in the south parts of Stockholm in a shop I had visited earlier. 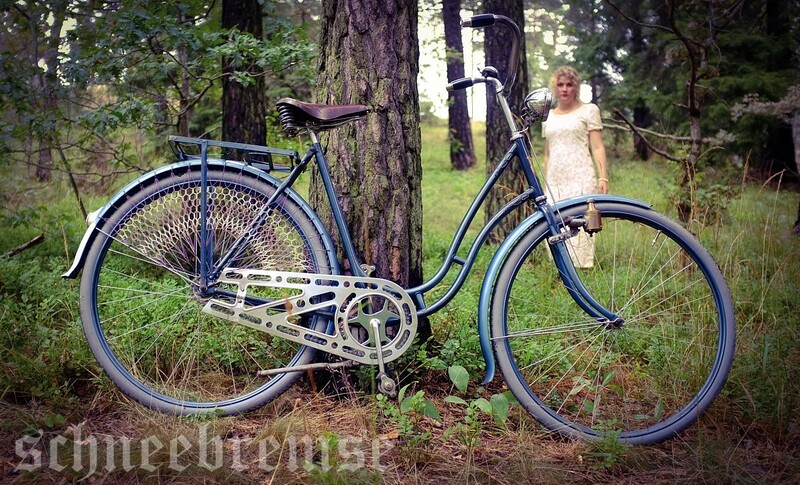 It was an old Swedish “Snabb” (quick) bicycle from the mid 1930’s. It looked to be in a good original condition with ornaments on the frame and with the original green paint with the golden pinstriping details still intact. I decided to visit the shop to have a closer look. After my visit I did a quick decision, the bicycle was perfect for me. Good condition, all important parts was there. So I simply paid for the bicycle and rode it back home, it was a good ride, smooth and everything worked as a charm. The bicycle was in perfect condition for what I had in mind. The idea of fixing up the bicycle as an homage to my grandfather and his passion for bicycles. After all he was riding them all year, no matter the weather, summer, wither, sun and rain. He was always riding his bicycle. 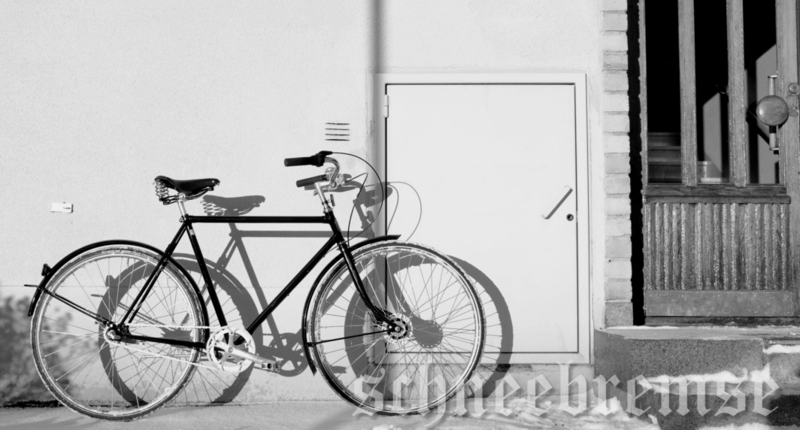 In a way, the Snabb that I bought could have been a bicycle that he could have used when he was living in the central parts of Stockholm back in the mid 1930’s. That was the spirit of the idea I had. I changed the small black 1920’s style headlight to a chromed bubble style headlight that was common in the mid -30’s. In my opinion it fitted the style of the bicycle better. I changed the seat to the old worn seat that was mounted on my grandfathers bicycle and that I remembered from when I was a kid. The bell, bicycle pump, the pump holders and other small parts all added up to an really great and lovely bicycle. There was even an old trouser clip that was an accessory back in the days. I do not use that, but I clamped it on the headlight mount. A small and nice detail. Original style lock with my grandfathers key tab attached. The trouser clip from 1930’s that I mounted on the headlight bracket. My grandfathers old saddle, worn and beaten up. But lots of memories for me. But then I realized that on top of the frame were 2 holes and an outlined shadow of an earlier plate with the owners name. That was a very typical extra feature in Stockholm at that time. It was more common to have a ring around the stem to the handlebars with your name and address. But in Stockholm it seems that this frame mounted plate was common. What should I do? I needed a plate to cover the already missing plate. But where to find a nameplate from the -30’s now? Even with or with out a name engraved on the plate it is an impossible mission. Then I remembered that a friend has, like me, also an Rex tandem with the nameplate from one of the first owners. I asked my friend politely if I could borrow the plate to make a copy of it, I would be very careful with the plate since it is unique. He said yes! By coincidence there is an silver shop that makes jewellery and art in silver in the area where I live. I went there and asked him about the name plate and if it would be possible to do a replica of it. Since the bicycle had the colours of green, black and gold I thought that brass would be a great material for the plate. The fellow at the shop said it sounded like a fun project. He loved to help me out. For many years I had a brass casing from a 20mm air defence gun in a pile of “good to have” things. The brass shell was curved just like the frame on the bicycle so it would make a great nameplate. The silver shop fellow started to work on the shell but quickly realized that the shell was made in a way that never would work, it was to thick in the bottom end of the casing (designed to withstand an gunpowder explosion). So he decided to take an old cracked cymbal he had as a drummer many years ago and cut a piece out of the cymbal instead. He polished it and did a wonderful work on the plate, making it to look like the style of 1930’s old plates with my grandfathers name and the address he had back in 1937. The brass name plate. Looks really good and matches the colour of the frame and pinstriping. A few weeks later I had a magnificent hand made plate in brass mounted on the frame of the bicycle. Of course it fitted to the holes and covered up the shadow on the frame, it looked a bit “new” and polished. But after a few days the brass started to oxidized and looked worn. A brass plate on a British racing green bicycle with details painted in black and gold, it looks really good. After all parts were fitted to the bicycle, even the small key tab that my grandfather used to have, I was ready for a test ride. If it was good before, it was even better now! The Snabb made a popular entry at the Bike in Tweed 2016 even. I got many compliments for the looks and condition of the bicycle. Is there any one who recognizes the location of the photos? During a photo session I attended to a few weeks back. By coincidence one of my friends on that photo session and I started talking about taking a new sets of photos with her as an model. I mentioned the old bicycle I had been renovation during the winter and that I wanted to take photos of for this blog. The idea of an photo session with her as an model and having period looking clothes came up. We both thought it could be a great and fun idea. After all, I had my favourite place in the forest nearby, where it is a good place for photos in an neutral place regarding when era the photos are taken in. We decided a date when we would meet and take photos of her and lady blue. All just for fun. The day had come. I made a quick service on Lady Blue, checking that all nuts and bolts where tightened and that the tires where filled with air after being standing unused for a few weeks. But now it was time for Lady Blue to see the sunlight again. To feel the road underneath her new tires rushing by. Feeling the fresh air and leaping forward like an deer. I took a ride to the meeting place on the bicycle. I was surprised on how smooth and quiet ride was. No rattling what so ever. Everything felt so perfect, like a brand new bicycle in a way. I have mentioned this before, but I can mention it again. The things I have done so far on the bicycle is that I first had the bicycle down in small parts. They were cleaned and greased up with everything what that includes. I also got “NOS” (new old stock) parts, to either replace the parts that where damaged or that were missing. First of all I got an very old and worn Brooks saddle along with a new made saddle post that fitted the bicycles old frame standard and the saddles mount. On an auction I found a 1930’s headlight made by the Swedish brand ASEA. I also found the dynamo that is from that era and the same ASEA brand on an different auction. The brand new grey tires are really looking like they are from that period, sadly there is a yellow makers brand on them. But they are only visible from one side. So I decided to mount the tires so the maker brand was facing the opposite way as the chain guard. That was only because to get the clean look on that side. I also got valve caps in metal with an small chain that are fastened on the valve it self. It is an small and silly detail, but it gives a great touch and looks just so great in my opinion. 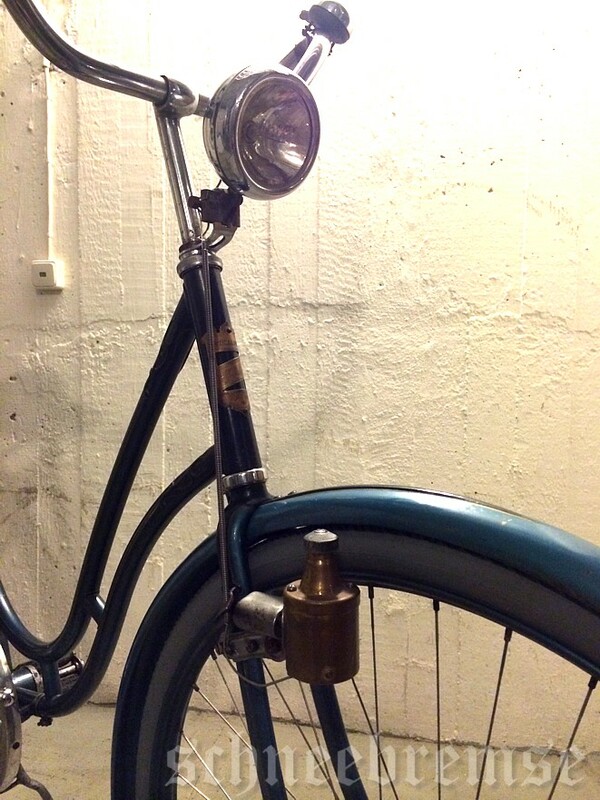 For pure decoration I got a spring that holds the electrical cord from the dynamo to the headlight. It was a very typical thing they had in the olden days. An unused chain guard was won on an auction. The guard still had the price tag in place. I polished up the chain guard up so it matched the other polished parts on the bicycle. In an bicycle shop I found handlebars with the right curvature as in the 1930’s. One more auction gave me a set of NOS wooden grips for the handlebars and an bicycle bell from the same era. The sound and chime of that bell. It is out of this world, so crisp and clear. After all years, it still works and are no problem with not getting attention. But that amazing skirt guard that I found long before. That I also have been talking about in earlier posts. It sure is looking really great on the bicycle! I must say that all the colours are really lovely in the sunlight, far greater than in the florescent lighting in the basement that I have been seeing it in so far. The net is shimmering in different colours and gives the bicycle a complete look. The frame, the mudguards and the polished parts, it all shines and have a depth in the colours. In short, Lady blue still got it. She is still a beauty, the grace and finesse is still there. The old bicycle rides as well as it looks after the renovation and are simply in great shape for being 80 years old. The girl I met for the photo session, saw the bicycle and liked it a lot. She tried it and took the bicycle for a ride, she really loved it. We went to the place for the photo session and took lots of photos. Included in this post is one of the photos. It was great to see the old bicycle being used once a again as it once was meant to be. But not as back in the days with rain, snow and hard work. 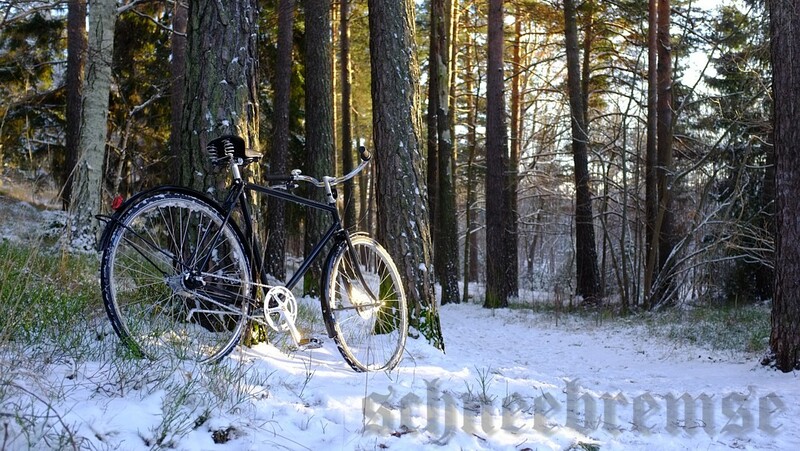 Now in 2014 the old bicycle will only being used on sunny days and going out for some nice rides. Lady Blue needs the rest. My intentions where to enter the Bike in Tweed race in Stockholm with Lady in Blue this year. Sadly I can not join the Bike In Tweed event this year due to reasons that I could not adjust in anyway. But if there will be an Bike In Tweed event in 2015, I will ask the girl with the blue dress if she wants to borrow Lady in Blue and join the event. I honestly think it will be an great combination and an very appreciated display by the other participants and the bystanders. Also the girl in the blue dress like the idea of dressing up and having fun. Who knows, she might even have a tweed dress in her closet… That would make it simply perfect. Fun in a tweed on a bicycle. This was planed to be the one of the last posts about “Lady Blue”. Today I was going to fix the handlebars. I started by uncover the bicycle from its protective dust cover i put on a while back. There she was, a real looker if I may say so. The I brought out tools and the NOS (new old stock) grips I bought on an auction, they are from the 40’s and unused. Now, it turned out that this matter with getting the grips on to the handlebar was an real adventure. First of all, let me explain how the grips is mounted. Back in the days it was mainly 2 different types of grips that was used. One style of grips was fastened with a expansion screw inside the bar it self. That is you mount the grip on the bar, then in some magical way there is a set of washers and special designed bolts that expands when tightening a screw at the end of the grip. Tight and the grip stays in place because the grip is made out of one piece of wood that has been hollowed out. Sometimes the wood was coloured or covered in a plastic material. A nice clean look. Then we have the slightly more crude version. That was to force a 10 centimetre wooden plug inside the end of the handlebar with a hammer. In that wooden plug, was is a pre-drilled hole to screw the grip into until it fixates the grip to the handlebar. The grip it self is made of two main parts. The end parts where the screw is and the wooden shell that is the grip. With this method, the grip can slide up the handlebar. To prevent this they put two small rivets on the bar so it stop the grip from slid to far. Now guess three times what kind of grips I got on the auction? Of course, the ones that fits the original handlebars, the style with a expansion screw inside. They do not work on the new replacement handlebars! I have other handlebars in storage of course, but they all are to modern. They are from 1960’s an forward, they do not have that typical nice, smooth 1930’s curvage that I need for Lady Blue. So, what to do? New grips? New bar? I must think this over for a bit. So for now there is no grips at all. On the good side, I adjusted the hight of the saddle, I also fitted a bell and an different Dynamo on the front fork. I finally found an Swedish made ASEA dynamo on an auction. So now there is an dynamo that matches the ASEA light I mounted earlier and they are connected with an wire that are inside a long spring, also an typical era accessory. The dynamo it self is a brass coloured big and heavy one, it still works and looks simply great, very impressive! The lamp is chromed and big. The spring is in stainless steel. It all looks really great. Back then (1930’s) a front light was more or less optional. There where all sorts of lamp styles, candle, kerosene, carbide, electric with dynamo, electric with battery. Bicyclists could buy all sorts of different after mark brands of dynamo and head light from bicycle retailers, post order and regular shops. It was only later in the mid 1950’s there was a law for bicycles to have front and rear light I think. Before that there was only an reflective red “cats eye” on the rear fender and optional light in front. So, now Lady Blue protests. Perhaps she do not want to leave the comfort in basement? It is summer outside now! Soon she will be out in the sun again and I will bring a camera. Does anyone want to see the results of that adventure?